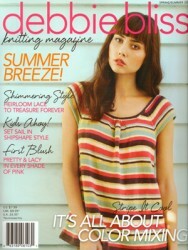 30 new patterns from Debbie Bliss in her very readable magazine for Spring Summer 2012. Includes Summer Shimmer using Angel yarn, Touch of Blush using the new Rialto Lace, Kids Ahoy using Cashmerino Baby and Eco Baby, and Simply Stripes and Coffee & Cream both using a selection of yarns. There are garments for women and children, and section on knitting for the home.